As leaders in ingrown toenail and verruca surgery, we use the best techniques and tools to ensure the best post-operative success. More than our expertise, we genuinely care about getting you the best results and making your recovery as simple and comfortable as possible. Each surgery is carefully tailored to your problem, needs and lifestyle after the procedure. We also guarantee the success of every procedure - see our guarantee section below. It’s all part of our commitment to providing the best in podiatric care to our community here in St. Heliers and Auckland. Both are performed by our expertly trained Podiatrists until strict surgical protocols and the complete recovery time ranges from 2-8 weeks, though you are welcome to return to work or school within 1-3 days. Verrucae, otherwise known as plantar warts, can be very painful, difficult to treat, and generally unpleasant to have on the feet. They are caused by a virus called the Human Papillomavirus (HPV). They are often contracted and present in childhood years, particularly from schools and shared facilities, though once contracted, can present at any time in adulthood. When warts present on weight-bearing areas on the bottom of the feet (the areas that take a lot of pressure when we take a step), they can become very uncomfortable and painful when going about our daily lives. Warts can be as small as seeds, or as large as fifty cent coins - sometimes even larger. If warts are already present on the foot, there’s a higher chance that new warts can pop up literally overnight. While we have many conservative treatments available for warts for all ages, at times, surgery may be the best option to get you back on your feet and walking normally and painlessly. Typically, this is when other treatment options have failed. Verruca surgeries are performed safely in our sterile treatment room by our expertly trained Podiatrists. A 'foreign body' describes anything that has been lodged in the foot that shouldn't be there or are causing pain. This includes shards of glass, pieces of metal, staples, splinters and painful hairs. 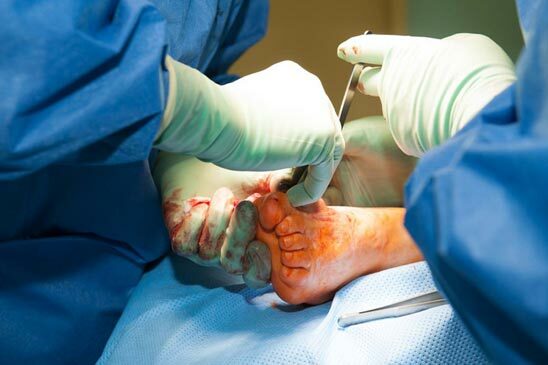 Here at Dynamic Podiatry, we’re proud to have a pristine surgical record, and in the event that you require further care for the diagnosed recurrence of the same condition, we will perform your surgical treatment again free of charge. We hold this guarantee even though many surgical outcomes are largely dependant on the patient’s repair and immune response, as opposed to surgical factors. It’s all part of our commitment to you to provide the best in Podiatric care. Want to permanently get rid of your ingrown toenail?